It’s rare to find a book that speaks all-together about the gender identity, Asian and a first-generation immigrant story. 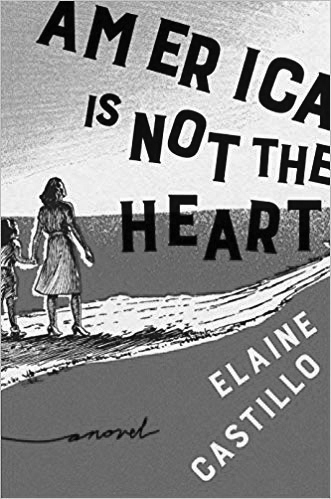 Elaine Castillo’s debut novel, America is Not the Heart, is somewhat of a homage to immigrants. Ms. Castillo recognizes the immigrants’ struggles and tells them that they are part of the story—the children of the diaspora, as much as most people in America. Ms. Castillo is a Filipino-American who was born in the San Francisco Bay Area. She is a graduate of the University of California, Berkeley. In America is Not the Heart, Ms. Castillo not only captures the beauty, difficulties, and joy immigrants face upon arriving in America but also highlights the historic Martial law in the Philippines. Her book represents the culture of the Bay Area, which is a home to working-class immigrants; as well as the discovery of one’s self-identity that moves between Marcos-era to Milpitas, California in the 90s. Ms. Castillo’s novel is also a reference to “America is in the Heart,” a semi-autobiography written by the Filipino immigrant Carlos Bulosan in 1946. The story starts by introducing Paz, a hardworking nurse, who meets her future husband, Pol De Vera, in the same hospital where she works. Pol is a brilliant orthopedic surgeon and a womanizer, who then is the “babaero of the hospital.” Paz migrated to California, and later, petitioned Pol, a process through which he becomes a lawful permanent resident of the United States while being with Paz. In the U.S., Paz becomes the breadwinner of the family, working 16-24-hour shifts, while Pol works as a security guard. Their lives are turned upside down when Hero “Nimang,” also short for Geronima, comes into their lives. Hero is Pol’s niece; she went missing back in the Philippines, and who everyone thought was dead. The story focuses on Hero De Vera, her poignant history, and her attraction to women in the world where the approval of queer relationships is limited. The De Veras are a wealthy and well-known family, who supported Ferdinand Marcos, a dictatorial leader of the Philippines in the early 1970s to late 1980s. During the 80s, Marcos ordered cities and towns to be held under the power of the Armed Forces of the Philippines and its predecessor groups; however, Hero went against the grain, and did not approve of the leadership her family was so determined to support. She became one of the rebels and joined the New People’s Army (NPA), the armed wing of the Communist Party of the Philippines (CPP). Hero’s time with Pol’s family in Milpitas creates a significant impact in identifying her and acknowledging her buried past. She builds a close friendship with Roni, Paz and Pol’s 7-year-old daughter, and becomes Roni’s nanny and accompanies Roni on a trip to find faith healers to cure the child’s eczema. Hero and Roni’s continuous visits to the healer make way for Hero to develop an intimate relationship with Rosalyn, who is the daughter of Adela, the faith healer. The distinctive prose Ms. Castillo has can be a challenge to a reader who does not have a Filipino background, and is used to reading the conventional style of a novel. She doesn’t use a lot of translations, doesn’t place quotation marks in dialogues, and doesn’t italicize unfamiliar words. It is a fun, and educational read to people as Ms. Castillo writes a lot about the peculiarities drawn by Filipinos amongst several local, ethnic, and dialectal groups, which makes it clear that there are many mundane aspects to Filipino-Americans’ culture. There are important aspects that Ms. Castillo has not missed–the mention of many Filipino cuisines, superstitions, and its pop culture are all present in Ms. Castillo’s contemporary prose. The mention of the Hukbalahap (Huk) revolution-aries, Philippines’ nation army against the Japanese soldiers, and the unending Communist resistance groups will motivate a reader to learn more about Filipino history. “One of the first stories Teresa ever told the cadres was a kind of NPA origin story, about the massacre of over a hundred former Huk fighters in Bulacan; intercepted on their way home to Pampanga, they’d been detained and then summarily executed by Filipino and American forces,” Ms. Castillo writes. The historical references about the Philippines thrown in throughout the story help the readers understand how each character has been affected by such events, and what they have become in the process. Ms. Castillo also successfully highlights the advantage of having light skin and the discriminatory effects of not being born with one. She writes, “María Josefa Gabriela, an Ilocana with a Spanish dad and uncertain maternage—a native maid in a colonial household, maybe Igorata or Tinguian. Either way, your lessons told you that Gabriela was a beautiful bolo-wielding mestiza. The mestiza part means they’ll definitely make a movie out of her life one day: people remember the mestizas.” Mestiza refers to a woman of mixed race, especially the offspring of a Spaniard and a Filipino. Hero’s point of view in the story switches between the past and the present allowing the reader to see the great length of the picture—how and why Hero is the way she is, and the complexities involved into making her the person she becomes. Hero’s character develops slowly in the story, but the gratification of realizing the harsh truth or perhaps the tender identification of oneself makes it worthwhile for people to read until the end. Ms. Castillo’s America is Not the Heart is in fact, hiding a big heart, one that is sympathetic to the journey of people of all walks of life.